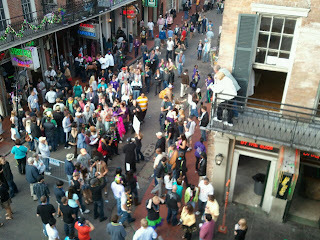 OK, Sunday Gras is not a real name (though Lundi Gras is) but that's what we called it in our adventures yesterday. Sunday was a mega parade day- 5 in one day. There were three in the morning; Okeanos, Mid City, and Thoth. Usually there is one super-krewe parade that night- Bacchus - but because of the horrible thunderstorms on Saturday, a second super-krewe, Endymion, rolled Uptown on Sunday night after Bacchus. Every year, every krewe has a theme for the year. Okeanos' was Children's Fantasies and Mid-City's was "Mid-City Marches On." Mid-City doesn't roll in Mid-City, but Uptown. Not sure how that works. The floats are all decorated with foil, as is their tradition. The Krewe of Thoth's theme was "Thoth Goes To College"
Also, it's funny how beads are coveted so much... till they hit the ground. Re: today, Lundi Gras. I won tickets to a Mardi Gras balcony party (from the Beer Buddha and Cork & Barrel) so my friend Trey and I biked out to the French Quarter. Drinking a beer while riding a bike was definitely a new skill set for me, but I mastered it eventually. We got to the Royal Sonesta to go to the Miller Lite balcony- hanging out on the balcony, I saw many many weird things. Well, not that weird. Lots of breasts, pretty much. I mean, you know. 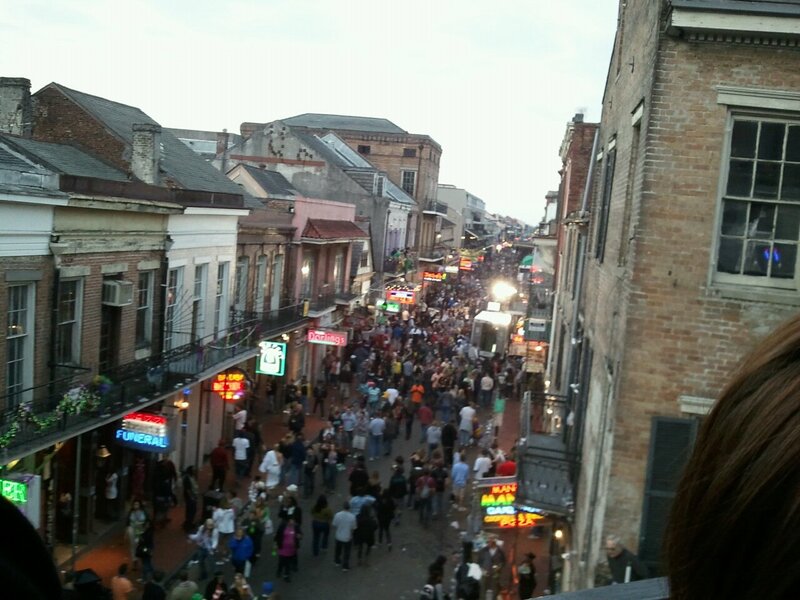 Bourbon Street. I left before dark. Tomorrow: Mardi Gras!!! And then sleep.